These are the words of Vince Rapisura or “Sir Vince”, a financial wealth expert, to an audience of teachers of Carlos “Botong” Francisco Memorial National High School on May 29, 2017 at the Ynares Multi-Purpose Covered Court, Antipolo City. 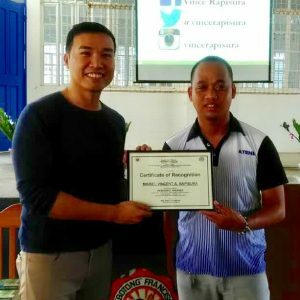 Appolo Reyes, a senior high school teacher of the school, invited Sir Vince to conduct a financial literacy training for his fellow teachers as part of their In-Service Training (INSET). “Sobrang baon kasi yung mga teachers namin sa utang kaya financial literacy ang ginawa naming INSET training. (Our teachers are buried heavily in debt that’s why we chose financial literacy for our INSET training. ),” Reyes said. Most teachers spend a large chunk of their budget to send their children to school. This is not at all bad. After all, it is the responsibility of parents to send children to school. According to Sir Vince, parents must set a budget per child when sending them to college. If the child wants to attend a more expensive school, it should be made clear that he will be responsible for paying the parents of the excess in budget when he starts working. “Ito ay para hindi ma-sakripisyo ang budget ng mga magulang para sa kanilang retirement at para maiwasan ding maging dependent sila sa kanilang anak pag dating ng retirement,” (This is to make sure that the budget of parents for retirement is not sacrificed and avoid being dependent to their children when they retire.) Sir Vince explained. Sir Vince cautioned that this should be openly communicated to children who are about to enter college to make sure that children understand what they are getting into. He shared that this was his sister’s strategy to her child who’s studying in college in the United States. It is not a secret that teachers do business on the side to augment their income. Sir Vince shared how he started his businesses to the teachers to address this. Sir Vince first worked in a non-government organization or NGO for four years to learn the ropes of the business that he later set up. “Sinigurado ko na ang papasukin kong trabaho ay related dun sa gusto kong negosyo,” (I made sure that what I would be working on as a job is going to be related with the business I want to establish later.) he said. In 2004, with a capital of Php 20,000, he established Social Enterprise Development Partnerships, Inc. (SEDPI). The company offers training, research and consulting services which he learned from his previous employment. He also emphasized that learning from employment before putting up a business will reduce business failure because one will learn how to manage a business; get acquainted with suppliers; get more in depth understanding of the needs of the market; gain skills in managing people and operations; and widen business network. Sir Vince reminded the teachers that if they put up a business, they should make sure that the business does not interfere with their teaching profession. He adviced them to hire employees to run their business to avoid this. 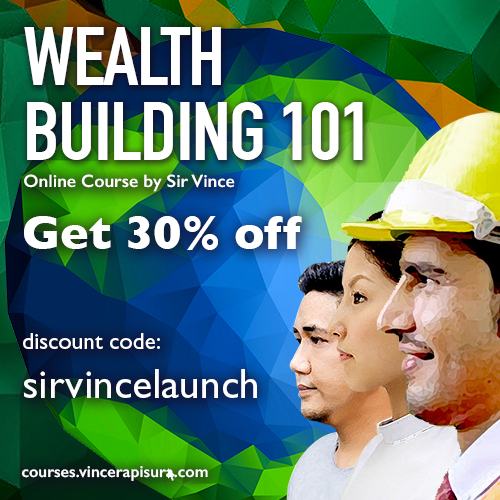 In the training, Sir Vince praised Benjamin Barcelona, Jr. for being financially free at the age of 31. Aside from being a high school teacher, Benjamin has other sources of income such as having a clothes rental for school activities/events such as Junior-Senior prom and graduation; a small sari-sari store; and six boarding houses. He explained the Mr. Barcelona was able to attain financial freedom at an early age since he used his existing skills and local knowledge to build businesses that complimented the needs of the school. He did not choose to directly compete with what was already available in the market. “The key is to identify and be very good at addressing a gap in the market,” Sir Vince added. Sir Vince went on to share with the teachers previous and present businesses that he established through the years. These include selling mobile phones and personal computers in his college years, a computer shop, and a piggery right after college. His ongoing business ventures include a training, research and consulting firm; a financing company; a residential rental property, a rural bank, billboard rental, and some commercial rental properties. He is also active in investing. There are four elements to success according to Sir Vince. These are kaalaman, kakayahan, kakilala and kapalaran or knowledge, skills, network and luck.